American dub music currently is experiencing a renaissance. In this regard, Roots Tonic Meets Bill Laswell, much as its title suggests, brings together legendary bassist and producer Bill Laswell and Roots Tonic, the backing band for Hasidic reggae singer Matisyahu. It also is a true summit of homegrown masters. Records like this provide proof that reggae has been around long enough to have insinuated itself deep into popular culture’s consciousness, so much so that it now can be played and understood by musicians outside Jamaica. Roots Tonic, for example, is a Brooklyn-based trio that features Josh Warner on bass and keyboards, Aaron Dugan on guitars and effects, and Jonah David on drums and percussion. Its members not only are top-flight artists, but they also perform at the same level as their Caribbean counterparts. Throughout Roots Tonic Meets Bill Laswell, their playing is inventive and completely credible, and the lack of a singer on this effort brings their powerful and intuitive abilities into the spotlight. There exists a level of ease and energy in their instrumental interplay that demonstrates how much Roots Tonic collectively has internalized reggae’s often deceptively challenging rhythms and counterpoints. Roots Tonic essentially plays the brand of King Tubby-influenced, roots-dub fare that has become immensely popular in recent years. What sets the group apart from other bands playing this type of music is the powerful, "take no prisoners" drumming that drives each song. The straight-ahead percussive charge that David mounts on each of the tracks on Roots Tonic Meets Bill Laswell proves that he is a force with which to be reckoned. In addition to the hypnotic rhythms that map out each tune’s trajectory, the material is fleshed out by — and, hence, it benefits from — Laswell’s trademark sonic touches. Taking his cue from Lee "Scratch" Perry’s love of found and manufactured sounds, Laswell has spent the better part of the past two decades concocting his own arsenal of bells, bangs, drones, and other assorted swampy effects, all of which give his mixes depth as well as swirling cadences. The atmospherics on this album are wonderful, though they create a more sinister mood than the zany, Inspector Gadget-isms that Perry loves to employ. 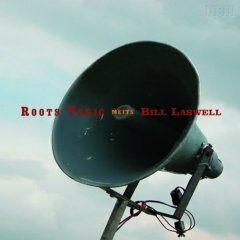 Roots Tonic Meets Bill Laswell is a great record, and it is a wonderful sign that American dub music has matured and grown out of the awkwardness and overcompensation that marked early efforts in the genre. In fact, tunes like Employees Must Wash Your Hands and Instrument of the Trinity are as inventive and complex as any dub tunes being recorded in the world today. To put it simply, this is powerful music that is played with passion and without compromise. It comes highly recommended for fans of old-school dub.